BANGKOK — Thailand's Election Commission said that computer software was partly to blame for inconsistent and delayed vote totals from last Sunday's general election. During early reporting of the election results, its tabulation software had trouble handling data entered simultaneously from several points and sometimes displayed incorrect numbers, the commission said in a statement Friday as it faced criticism over lack of transparency. Several political activists said they are starting a petition to impeach the election commissioners. On Thursday, the commission issued a 208-page compilation of votes in every constituency in response to criticism, but some tallies still failed to add up correctly. The commission's figures show the party supporting the current military junta had the most popular votes, trailed by its main challenger, the party ousted by the military in a 2014 coup. The military-backed Palang Pracharath Party supports Prayuth Chan-ocha to continue as the country's leader. As army commander, he led the 2014 coup and has since served as prime minister and junta chief. The main challenger is the Pheu Thai Party, associated with former Prime Minister Thaksin Shinawatra, who was ousted by a 2006 coup. 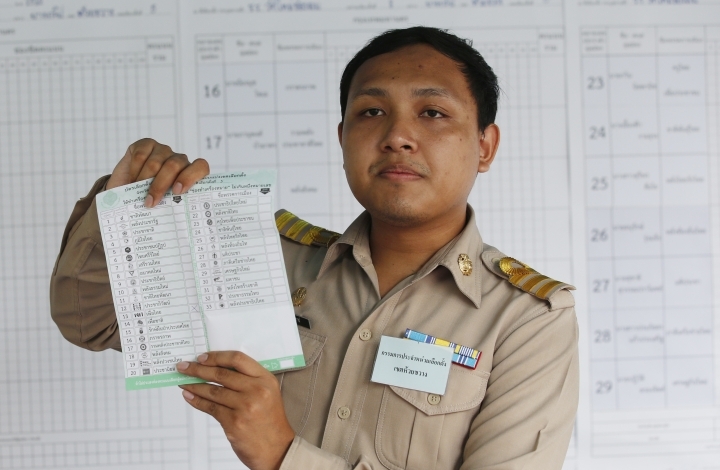 Pheu Thai's candidate for prime minister is Sudarat Keyuraphan, who has charged there were irregularities in Sunday's vote. On her Facebook page on Friday, she described alleged tampering with ballots. Pheu Thai announced on Wednesday that it had assembled a coalition of parties that would hold a majority of seats in the House of Representatives. But because an appointed Senate also votes to pick the new prime minister, a majority in the lower house alone would not put them in power. The Senate members are indirectly appointed by the ruling junta, and are virtually certain to back Prayuth for prime minister. Disqualifications and other rulings by the Election Commission ahead of May 9, when it is supposed to formalize the election results, may also affect how the new government is formed.